I have also decided to wait until they fix the stuff and get it going completely. Thanks Vyankatesh. The good thing in all this R & D was that I got the profile pics back on, in comments. For some weird reason (Read: messed up code) they weren't showing earlier. Yeah I've noticed the threaded comments for blogger too...but I use a non-blogger custom template and I was sure it wouldn't work for me coz the template I use goes really crazy with scripts and stuff, so I never tried it, and seeing your analysis, I now confirm that it wouldn't work for me...I'm going old school too, thanks for this post. Hi Rads! Well the hack posted by nitecruzr is really very simple. I'm sure it would work on your template too, i.e. if do want threaded comments. I think its already done for admin comment. coz u can customize blogspot default threaded comment. Because now already have many tutor to customize threaded comment. Hi MRie RNie. Thanks for dropping by & sharing that post. I went through the code in that post. 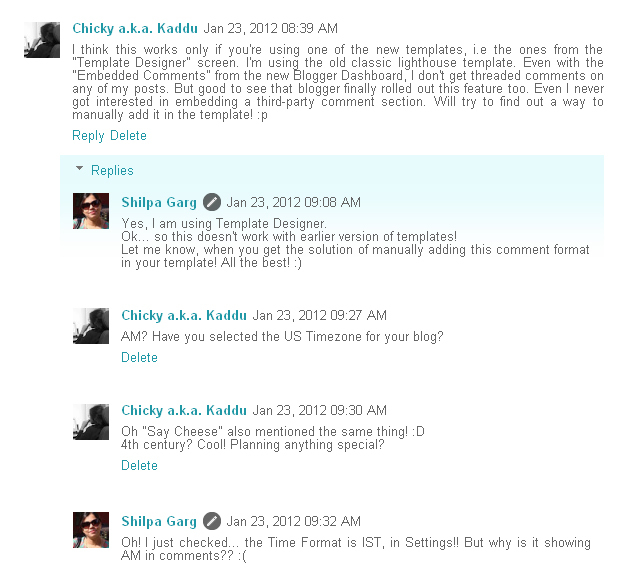 Apparently, it is a manual hack for getting threaded comments in blogger. My post above was about the official blogger threaded comments. I found them quite shabby when I tried them.